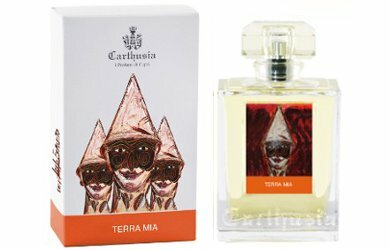 Italian niche brand Carthusia will launch Terra Mia, a new unisex gourmand fragrance. Here is Bergamot, which with Neroli and Pink Pepper greets lively, almost a song. Or is it the laughter the mask of Pulcinella provokes? Rose and Jasmin fill the air, quick, a hint of a lenient season which here lasts longer than elsewhere. And leaves room for coffee – drunk or ‘suspended’, sospeso – whose aroma surrounds everything and greets the passers-by, often conjuring with the Hazelnut Accord and the Orange Blossom Absolute. They are the merry characters of a certain indulging which springs from tradition and conquers palates and hearts. Terra Mia was developed by perfumer Luca Maffei. Additional notes feature ambroxan and musk. Carthusia Terra Mia will be available in 50 or 100 ml Eau de Parfum or 50 ml Parfum. Had a hard time with the copy but love the packaging! I don’t think I’ve tried any Carthusia yet though. I don’t understand why brands use what must be machine-translated copy, but clearly they do! The notes sound pretty good. Hazelnut + coffee + orange blossom sounds really good to me! I have been looking forward to this one. Hoping Luckyscent or somewhere with samples will have this soon. Now that is one creepy label.